If you are thinking about joining the thousands of people who are "going keto", or if you are already trying the keto diet, you probably have read that this eating plan is a powerful way to naturally use your own body to lose weight, increase mental clarity, and improve physical performance amongst many other benefits. If you have already started, you might have guessed via various signs in your body that you are in a state of ketosis, but what if you only have a few pounds to lose or you aren't sure about those clues your body is giving off? Test, don't guess, as the old saying goes. Let's talk about the three different types of ketones in the body and how you can test them using different techniques. Each of these unique compounds performs different functions in the metabolism of ketosis and each can be tested. Not all measuring tools are the same, however, as some are better (more accurate) than others depending on the time the testing is performed, as well as the purpose as to why you are doing this test. These three ketones can be measured when they spill over into your breath, urine, or blood. The good thing about today's times is that you can measure all three of these at home, no lab work or doctor required! Smackfat Ketone Strips - darker shades indicate progressively larger amounts of ketones detected in the sample. 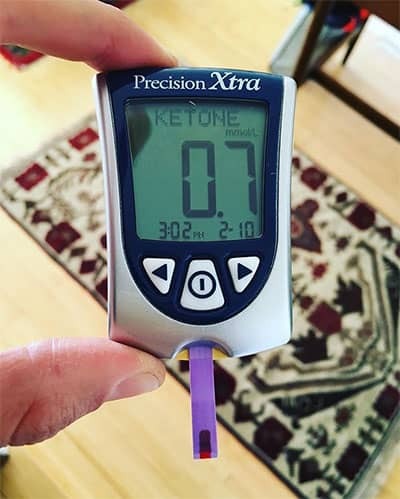 This is the most popular method of testing for ketones, most likely because it's inexpensive and easy to do. When you are in a state of ketosis, ketones will be secreted by the body and they will overflow into your urine. The test is certainly easy enough; pee on the stick or strip, tap it to shake off the excess, wait 1 minute to see results. Speaking in general, depending on the brand, the darker the strip, the more ketones you are excreting. Urine strips are available everywhere and inexpensive, which makes them the first choice most people turn to. The most accurate method for measuring ketones in your body is via blood. These devices are similar to the way diabetics check their blood sugar levels. You use a lancet to poke your body (usually your finger), place a drop of blood on the strip and you should have a precise measurement in about 10-15 seconds. The blood level of BHB is measured in something called millimolar concentration, otherwise known as mmol. No doctors or labs are required, you can get a precise measurement at home, however, you will still need to buy lancets and strips, in addition to the device. Another ketone body that is produced when you are in a state of ketosis is acetone or acetate. By measuring your breath for these substances, you can also find out if you are in ketosis. The most commonly used devise is the Ketonix unit, which measures the acetone in your breath. These are measured in parts per million (ppm) and can measure anywhere between 1 and 1250 ppm. There are several devices which usually tell you the level of ketones using different colored lights. One of the advantages of breath measurement is that you only need to buy the Ketonix unit one time, unlike strips, which you will need to buy repeatedly. Everyone has their own preference when it comes to testing methods, so pick whichever one works well for you. There is no right or wrong way to measure this, just pick your method and go all out keto!